Spread the Love! Do you want to grow in Love? 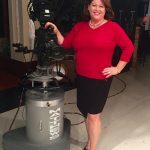 We all want a caring family and closer community, but with all the difficult happenings in the world, creating close relationships can be challenging. Fortunately, there’s something positive for families to do together to grow in love. 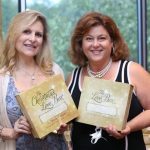 National Love Note Day is coming and we will celebrate by bringing families, friends and non-profits together at ‘Love Notes Live!’ events. Currently two events are planned. 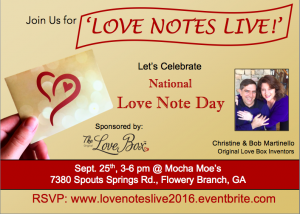 One event is in Flowery Branch, GA on Sun., Sept. 25th from 3 – 6 pm at Mocha Moes coffee house. The other one is in Dayton, Ohio. Creating closer families and communities takes some time and effort. We’ll provide an opportunity for everyone to express their love at the ‘Love Notes Live’ event. 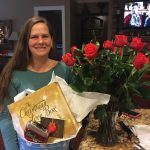 We are excited to see the love flow and the lifelong impact that heartfelt notes provide. We sure do! Hope you’ll join us. 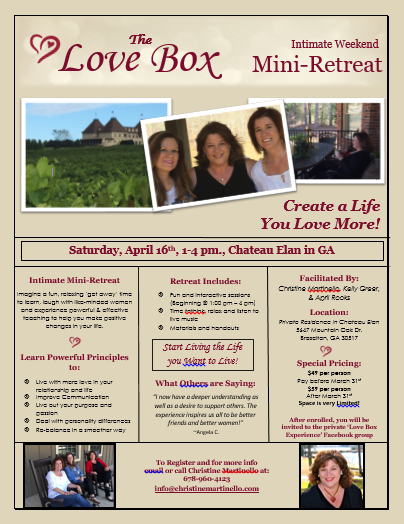 “The Original Love Box is the perfect way to lead your family in a tradition of love and gratitude for each other.” -Rachael Bodie, Mom & John Maxwell Co.
Love Box Events promote Love. 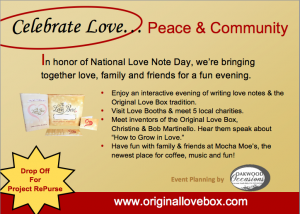 National Love Note Day Events Are Coming! It’s Sept. 26th. We’re hosting events in ATL and OH. Stay tuned for more info. Book Us for a group event. You can now register to host a Mini-Retreat. 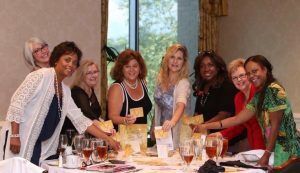 We offer community building events for deserving people. Love Agents write love notes to people impacted by violence (Orlando love note campaign). We also touch women who are recovering from domestic or substance abuse.